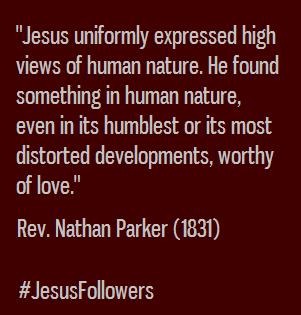 Jesus uniformly expressed high views of human nature. It was over the perversion of its gifts, the abuse of its powers, that he mourned; but it seems never to have been his delight to magnify human guilt. He found something in human nature, even in its humblest or its most distorted developments, worthy of love. You see him gathering around him little children, pressing them to his bosom, speaking kindly to them. He could not look upon the unwrinkled brow, the fair countenance of childhood, and contemplate the child as an object of God’s displeasure. Look at his interactions with his immediate followers, how perseveringly obstinate was their hold upon long cherished prejudices! How slow were they to enter into his spirit, and to yield themselves to the full power of his instructions! Yet how patiently did he work with them! How kindly did he apologize for their lack of zeal in his cause! True it is, that he fearlessly rebuked sin; but in what spirit did he rebuke it? With the utmost compassion. We look to the Reformers, who have appeared in different periods of the Christian church. We see in many of them high powers, determined hearts, and persevering efforts, qualities, which claim for them great respect. We see none, however, unbiased by local interests and prejudices. Jesus stands at an immeasurable distance from them all. W see none, who are actuated by a generous, unmingled love, like that which Jesus manifested. By the honest friends of Christianity, many devices have been invented and practiced to give power and interest to its instructions. The terrors of the Lord have been proclaimed, in the language of power acting for destruction. The passion of fear has been used without restraint, and all the passions associated with it have been addressed. The power of party has been tried, and so has that of pomp, of show and of boasting, of forms and ceremonies, of fasts and prayers. But has the power of love been uniformly, and extensively tried? Has the true spirit of Jesus ever yet been fully exhibited, either by his ministers or his church? I fear that it has not; and that even some good men are most woefully deceived as to the tendency of their own influence. Here I see, what the spirit of Christ is, what the fruits of his influence are; and I utter in sorrow the deep conviction of my soul that the spirit of pure love, as it appeared in the teachings of Jesus, is not found extensively abroad for the reformation of the world. Without this spirit, zeal may work with all the power of passion, sect after sect may put forth its rival claims, and missionaries may travel the globe; but the world will continue to writhe under the tortures of sin, and souls will continue to perish.